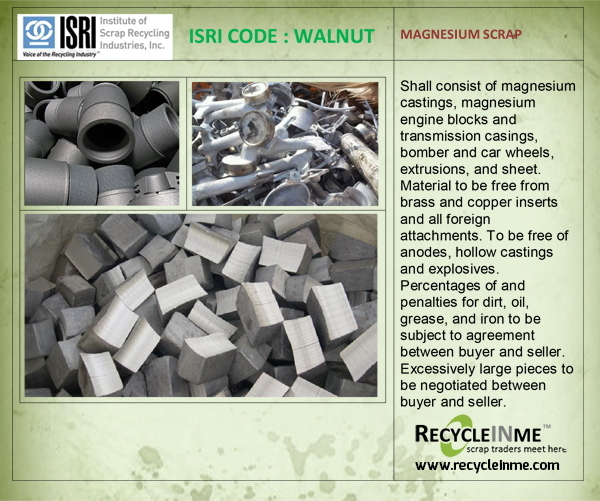 ISRI CODE : WALNUT consist of magnesium castings, magnesium engine blocks and transmission casings, bomber and car wheels, extrusions, and sheet. 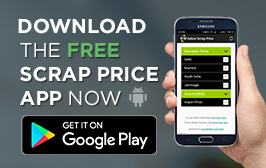 Material to be free from brass and copper inserts and all foreign attachments. To be free of anodes, hollow castings and explosives. Percentages of and penalties for dirt, oil, grease, and iron to be subject to agreement between buyer and seller. Excessively large pieces to be negotiated between buyer and seller. 81042010 - Waste and scrap: Magnesium scrap, namely the following: Magnesium clips covered by ISRI code word ÂWaferÂ; Magnesium scrap covered by ISRI code word ÂWalnutÂ; Magnesium engraver plates covered by ISRI code word ÂWineÂ; Magnesium dock boards covered by ISIR code word ÂWoodÂ; Magnesium turnings covered by ISRI code word ÂWorldÂ.